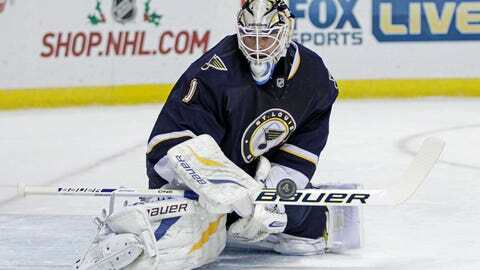 Brian Elliott and the Blues are sixth in the NHL in goals-against average (2.3). ST. LOUIS — It was going to happen at some point. There were going to be bumps along the way for the St. Louis Blues. The NHL regular season is a physical and mental grind for 82 games, and the first third of the schedule revealed the Western Conference is as strong as ever with the Blues, Blackhawks, Ducks, Sharks, Kings, Wild, Canucks and Avalanche all emerging as contenders. Just 11 days ago, the Blues were riding a five-game win streak and took an 18-3-3 record into a game at San Jose, the second of a three-game road trip to the West Coast. But now, after three losses in their last four games, the Blues are 19-6-3 and faced with questions about their recent string of slow starts and whether this is just a bumpy stretch or a warning of more significant problems. “I get the fact that the enthusiasm to the start of the year is over,” Blues coach Ken Hitchcock says. “Now you’re into the grind, and how you operate in the grind tells a lot about your team, and I want us playing better in the grind here. I want us checking harder, I want us competing harder, I want our best players playing better. I want all that stuff at this time because this is the hard time. The Blues will play in Winnipeg (14-13-4) tonight hoping to shake their recent struggles. St. Louis, which will have Brian Elliott in net against the Jets, is still second in the NHL in goals per game (3.4), second in power-play percentage (24.3 percent) and sixth in goals-against average (2.3). Some of those numbers were bolstered by Thursday’s 5-1 win over the Islanders at Scottrade Center, a game in which the Blues scored three power-play goals against one of the worst penalty-killing teams in the league. But when St. Louis lost to visiting Anaheim 5-2 two days later — for their third loss in four outings — the questions and frustrations came back anew. The Blues were outscored 9-0 in the first period of those losses against the Sharks, Kings and Ducks. They scored only one goal in the opening period of the win against the Islanders, meaning in the four-game stretch they were outscored 9-1 in the first period. St. Louis is fourth in the NHL in goals scored in the first period (29) this season, trailing only the Sharks (40 in 30 games), Ducks (36) and Senators (31). But the Blues have also allowed 29 goals in the first period — the sixth most in the league. Hitchcock’s club is well aware of its recent first-period struggles. The players have been asked the questions, too. They can talk all day long about what they must do to change things. But the key is to go out consistently and compete as soon as the puck drops. The Blues have 11 games left in December, with three of their next four against teams with losing records. After playing in Winnipeg tonight, they’ll host the Maple Leafs (16-12-3) on Thursday before games at Columbus (12-15-3) on Saturday and at Ottawa (12-14-5) on Monday. St. Louis has also played fewer games than its Western Conference counterparts. The Blues (41 points in 28 games) are fifth in the West behind the Blackhawks (47 in 32), Ducks (47 in 33), Sharks (43 in 30) and Kings (42 in 30). They are ahead of the Wild (41 in 32) and Canucks (41 in 33). So even with a recent swoon, the Blues are still very much in the hunt. There’s no reason to panic. Not yet, anyway. After all, this is the time in which teams are built.